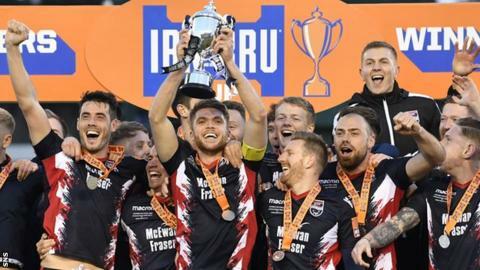 Ross County lifted the Challenge Cup for a third time after coming from behind to beat Welsh side Connah's Quay Nomads with a late flurry of goals. Two Josh Mullin strikes and one from Jamie Lindsay in the last 15 minutes turned the game in the Scottish Championship leaders' favour. The Welsh Premier League side were looking to become the first non-Scottish winners of the trophy. And Michael Bakare's superb first-half strike gave them hope of an upset. Nomads travelled north knowing that The New Saints had overtook them at the top of the Welsh Premier League after Friday's 3-1 win over Bala Town. And the final kicked off at the home of County's Highland rivals, Inverness Caledonian Thistle, moments before Dundee United scored a late winner over Alloa Athletic to narrow at the gap at the top of the Championship to five points. It looked like it might be a bad day all round for the Dingwall side as Nomads, the first non-Scottish team to reach the final, broke the deadlock when striker Bakare's left-footed drive found the top corner from just outside the penalty box. The Welsh side managed by Inverness-born Andy Morrison also came close when Michael Wilde headed just wide and Andy Owens nearly doubled the lead for Nomads when County's Ross Munro gifted the ball to him with a short pass. But the goalkeeper redeemed himself with a fine save from the resulting shot. Bakare came close again on the stroke of half-time when his shot came off the crossbar and was cleared. County applied huge pressure after the break as their full-time training began to tell against the part-timers. Headers from Michael Gardyne and Kenny van der Weg were kept out by goalkeeper John Danby. The leveller eventually came courtesy of Mullin's right-footed effort from a Marcus Fraser cross and, just three minutes later, the substitute struck again, this time from 18 yards. Lindsay sealed the victory with a shot from the edge of the box three minutes from time, while Ross Stewart came close to making the score more emphatic when his effort hit a post.